I think one of the best ways to update your bedroom's soft furnishings is with a fancy new upholstered headboard. I have seen a few posts around the internet that outline how to make one and they look surprisingly easy. Currently, my headboard is a big brass number, but I cover it between the posts with different bedspreads, throws or even scarves depending on my mood. If for some reason I no longer had my brass bed, I'd definitely make my own headboard. This seems like such a budget-friendly way to infuse new life into a room without the mess of painting or rearranging everything. Your new headboard could be anything from a heavily textured fabric that exactly matches your wall color to a loud print that contrasts like a piece of fine art. The sky's the limit! With the low cost of fabric remnants, this is a very cheap and chic project. If you're very crafty you could embellish even further, say, by adding contrasting ribbons, lace or buttons. While an easy and inexpensive thing to make, this idea could be reworked in lots of ways to suit your creativity! I like to sit up in bed at night and read so much prefer a padded headboard to something harder. Whether you choose to cover a wooden frame with batting or wadding and then cover with fabric (actually, perhaps an artist's canvas would make this even easier) or are re-covering an existing padded headboard to give it a new lease of life a staple gun is all you really need. I recovered an old and tired looking padded headboard in my home with a co-ordinating bed sheet from the same range as my duvet set for a really nice look. A friend of mine regularly buys old padded headboards from our local Salvation Army shop for as little as £5 for a single bed size. She sprays them with fabric cleaner to freshen them up then recovers them with fabric she picks up from the remnant bin in our local fabric superstore. I'm sure each one costs her no more than £8 for the finished item and she can easily sell them for £15 - £20 at a car boot sale or school fete or somewhere like that. She uses 'pester power' as a selling tool - using bright pink for the girls and a fabric with rockets or racing cars for the boys - she really benefits from the cries of 'please mummy...', 'please mummy...'. Join in and write your own page! It's easy to do. How? 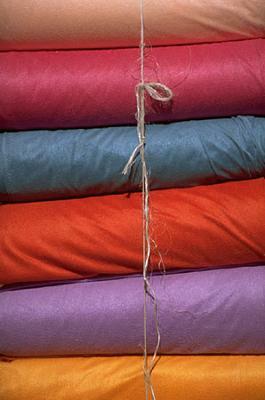 Simply click here to return to Soft Furnishing with Fabric.